The 1998 vintage received great praise from various critics as well as from the winemakers themselves. A warm summer, with a touch of rain in September, followed by more warm weather, created conditions that allowed for winemakers to pick good quality fruit. 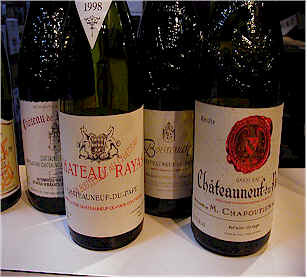 Early reports noted the rather dark and intense colors of the Chteauneuf-du-Pape wines. The Wine Spectator notes the "...dark, rich, ripe, thick red Chteauneufs..." and the wines are said to be the best since the 1990 vintage. We assembled a range of what are now expensive wines, thanks to the high praise heaped upon the wines. We purchased a number of bottles that were purchased from European sources. The prices paid are relatively ridiculous, but reflect the active market conditions for this vintage. The wines ended up being closely bunched into two groups. The 4th place through last place wines were separated by a mere 10 points and the three top finishers were within 2 points! 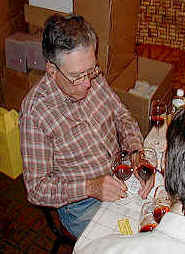 Tasting Notes Written by Bob Gorman with Gerald chiming in. One taster found minerals and boiled eggs, a wine both ripe and highly acidic. Another found it indistinct, warm and closed. Other descriptors included cardboard, sulfur and citrus. Bob liked this thick, dark version of Chateauneuf with its smoky, metallic edge and its incredible sweet/ripe plum fruit and spice. Sweet oak really gives the fruit a major boost. The palate shows old-vine Grenache fruit of excellent depth but the wine finishes a bit abruptly. Gerald described it as having "red fruit aromas and some raspberry notes...nice...tannic and structured on the palate with fairly aggressive tannins. Half-star rating (three star scale, 0=average). This can go five to ten years." The wine elicited quite a panoply of descriptors. There was tons of grapefruit, violets and red berries, honeysuckle, charred and silage. One taster much liked it at first but found that it fell apart as it opened up, finishing very flat." Bob liked its "pretty Chteauneuf nose, in spite of traces of leather (Brettanomyces) and cardboard. It had a candy-like sweet aroma with raspberry, strawberry and plum. And what a nice grippy mouthful, very Chateauneuf-du-Pape, plums, spice, terroir, delicious! Gerald found "Mild raspberry notes with a hint of spice and a touch jammy...not especially profound on the palate, but quite good with ripe fruit and light tannins. One star. Two to five years of cellaring potential." One taster found this a lighter, simpler, more cherryish Chateauneuf. Another found a preponderance of Grenache, warm red fruits, pencil shavings and a nice clean finish. One enthusiastic supporter exclaimed, super wine! while another thought it simple and one-dimensional. Bob much liked the wine for its ripe red fruits, its zip, sweet herbs, roots with a nice contribution from wood: gorgeous nose! The pretty side of Chteauneuf, the palate shows a wine which is full and deep with Syrah dominating flavors that are all over the palate. Theres a perfect ripeness to it. Gerald detected but "light berry and faintly spicy notes in this moderately jammy red...tannic on the palate with ripe fruit, berries...typical...okay. One star. Five to eight years' aging potential." One taster characterized the wine as having spice and forward blackberry on the nose, highly extracted, complex and rich fruit on the palate with a nice aftertaste. Another found strawberry jam, spice and a nice oak component. Other descriptors included prunes, black pepper, nutmeg, sour and fruity. One taster found more than usual percentage of Mourvdre in the blend, which was right on as Beaucastel has, indeed, a higher percentage of Mourvedre. 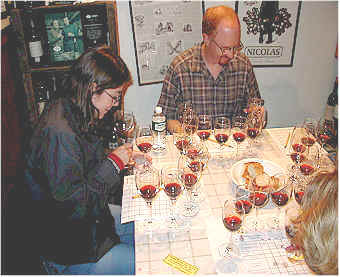 Bob marked the wine way down because of some curious and unbecoming cellar odors that no one else detected. He also found a roti (roasted fruit) character along with prunes and oak. On the palate there was ripe raspberry fruit, tannin, a bit bald, not showing major concentration. Gerald's note include descriptors such as "red berry notes...sweet fruit...light tobacco aromas...earthy...more concentration and flavor interest than the nose indicates with nice fruit and a fair bit of tannin. Enough fruit to match the tannins. Five to ten years aging. One-and-a-half stars." Bob found minerals, fruit pits and exotic spice (cumin/geranium). The wine has old vine Grenache character, very special! Ripe Grenache dominates the palate with fair length and concentration and a slightly bitter finish. The wine disappoints from the promise of the nose. Gerald found "smoky, earthy, tarry notes on the nose with an odd note, but quite complex and interesting. It's tannic and shows the earthy notes on the palate. One-and-a-half stars, with 7-12 years of cellaring time possible." One ambivalent taster led off the discussion, describing the wine as herbaceous, coarse and interesting. (!) A second found nice acid, red fruits, tobacco with nutmeg and clove on the finish. A third found it relatively high in alcohol but complex and delicious. One taster found it meaty and sour at first but it opened up nicely. Bob found "Chteauneuf minerals, red fruits and fruit skins, lots of spice and, uncharacteristically, cherries (its hat tipped toward Burgundy). On the palate the wine is easy, delicious with a raspberry candy edge. The wine is a bit facile but who couldn't take major pleasure drinking this?! Its flat aftertaste marks it down." Gerald detected the "typical spicy, minerally, stony notes of Grenache with a bit of spice and orange peel fragrances...ripe fruit with sweet berry notes and a touch of orange, too. Nice tannins suggest 5-8 more years of aging. Two stars." Here was another controversial wine. The nays shouted Tannic City! and horse barn! One taster found iodine with another adding bitter, sour and metallic. The ayes found it big, robust and well balanced. This latter group included Bob who found a "thick, Bretty brew with berries, amer (bittersweet), orange peel, Chteauneuf terroir, authority, and spice; a wine on a grand scale. The Brettanomyces is not a bother with all that fruit. Heres a Chteauneuf with thick, gorgeous fruit, exceptional length, promising an illustrious future. There is some serious tannin here but the fruit warrants it. Gerald liked the "meaty, leathery notes that recall the Mourvdre wines of Bandol. The wine shows big, ripe black fruit notes and a leathery note as well as substantial tannins that suggest 8-15 more years of cellaring. Two stars+." One taster spoke for several describing the wines concentrated fruit, full body, balance, excellent acid, red fruits, dried leaves with black pepper on the finish. A less enthusiastic taster found salt pork and jam with a dissenting voice finding volatile acid, a wine with nowhere to go. Bob joined the enthusiastic majority finding deep Chateauneuf terroir: stones, smoke, dust, and earth with bright Syrah/Grenache fruit, a sweet fragrance. On the palate red fruits just burst open in the mouth. The wine is luscious, clean, seriously concentrated if not complex (yet!). Gerald liked the "berry and slightly gamey notes along with a hint of peppery spice on the nose. The palate offers even more depth than found in the aromas, with good spice and tannin. Three to 8 years of cellaring are warranted. Two stars." 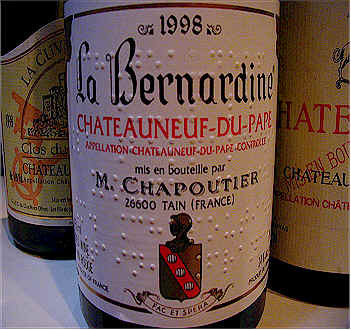 Chapoutier's labels are also in Braille which caused on politically incorrect wag to comment the Chapoutier entries are "the perfect wines for a blind tasting!"